Lookee What Linda Did for XMAS! First of all, let me say that I am blessed with four wonderful children. In ascending order of age, is Kris, 21, mine by birth, Sean, 23 and Jo, 25, by choice when I married their Dad and the newest edition, Brad, 26 by marriage to Jo two years ago. Quilting is a gift of more than fabric and thread and supplies. For me, it is a gift of my time, my creativity and most of all, my love for the recipient. Last year I decided to surprise the kids with cuddle quilts. I started last February and made Brad’s first. Being the “fabricaholic” I am, I knew exactly where to start from my stash. 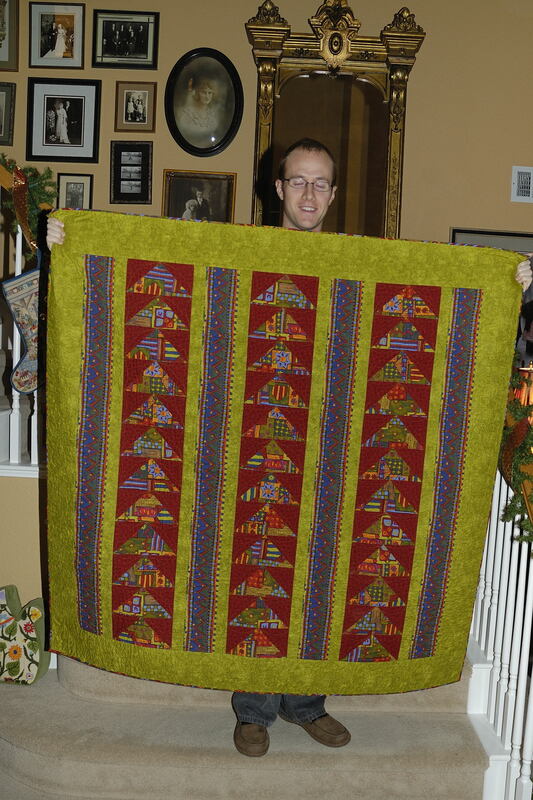 The quilt uses several rows of flying geese and the quilting has lots of movement. Appropriate for Brad as he works toward his PhD in Genetics at USC. A quilt of movement with a direction. Next came Jo’s. I had purchased the nurse blocks in Chicago several years ago, knowing that someday I would make something for Jo with the fabric. Jo entered a Masters of Nursing program at Cal State, LA in 2007. After completing her first 4 quarters of study, she received her RN and passed her boards. 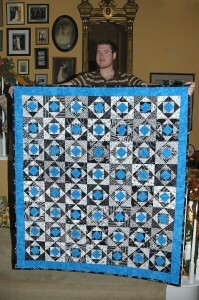 A quilt using the nurse fabric was the perfect fit!. 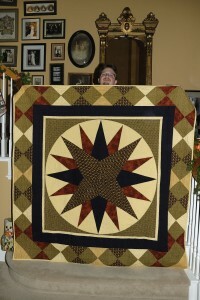 Her quilt like Brad’s uses the flying geese blocks blended with the nurse graphics. She too is constant in her direction toward completion of her Master’s degree in Nursing. Sean’s quilt was next. I’ve been saving pieces of black and white fabric for this quilt for years. 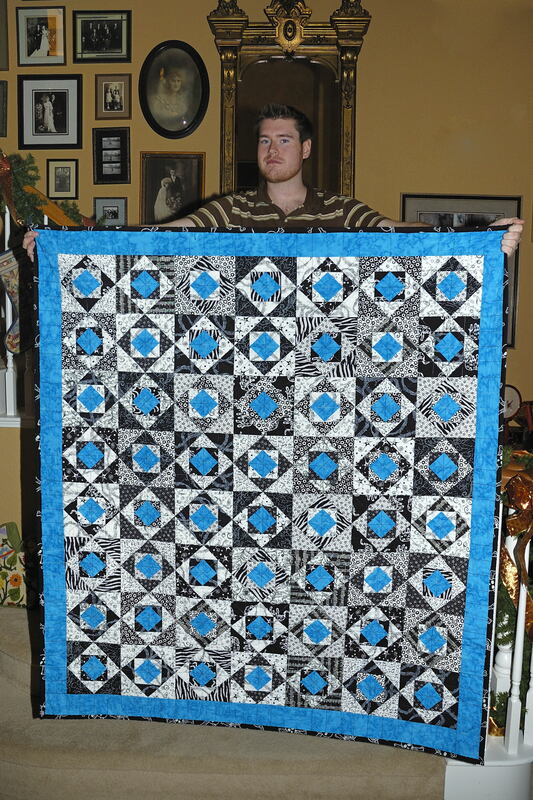 I always knew his quilt would be black and white. But Sean has a quick wit and vast reservoir of creativity, so the quilt needed something to add a liveliness to it to match him, so a pop of aqua did the trick. Kris’s quilt was the last to start. He was still at home when the project started so was the only one of the kids that knew what was going on. He wanted “input” into his quilt so we collaborated on the design and the colors. This was as much of a blessing as it was a curse. 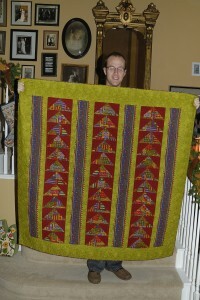 The freedom of design and color I had enjoyed with the other quilts was now being tempered. Hmmmm, this was going to be harder. Kris is a wonderful blend of Science and Artistry. The central medallion pointing out in all directions captures his energy; many interests, many different directions, all coming from a central core. 1. Even though they are all away from home now, the process of creating the quilts made me feel close to each one of them even though they are scattered across California. 2. 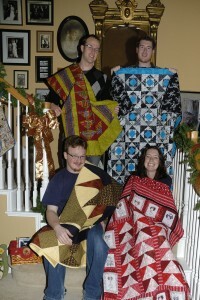 I received a gift from each one of them when they opened the wrapped quilts. Their gift of enjoyment and delight in receiving the quilt became mine in return. 3. Each quilt got larger (I have no idea how this happened, it just did). 4. On the Sunday before Christmas, just as I was half way through the quilting on Kris’s quilt, my Bernina sewing machine began to make horrible klunking noises. I stopped, took it apart, cleaned it, tinkered with it but to no avail. I was heart sick. I was so close to being done. I remembered my old friend in the back of the closet. The Viking machine I’d bought when Kris was a baby. It hadn’t seen the light of day for 4 years since the Bernina came home. I swallowed hard and decided to give it a try. It took two hours of collecting all the parts, tuning the machine, finding the manual (I couldn’t even remember how to wind a bobbin on it anymore!) Slowly, my old faithful friend began to purr. Harrah! 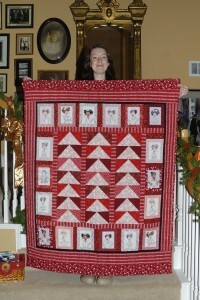 I put the last stitch into that quilt at 7 pm on Christmas Eve. Just like any good project manager; on time and on budget! 5. The final lesson was one of dropping perfection and working toward excellence. Who knew that I would get so much in return! Now on to a quilt for Don’s and my bed! 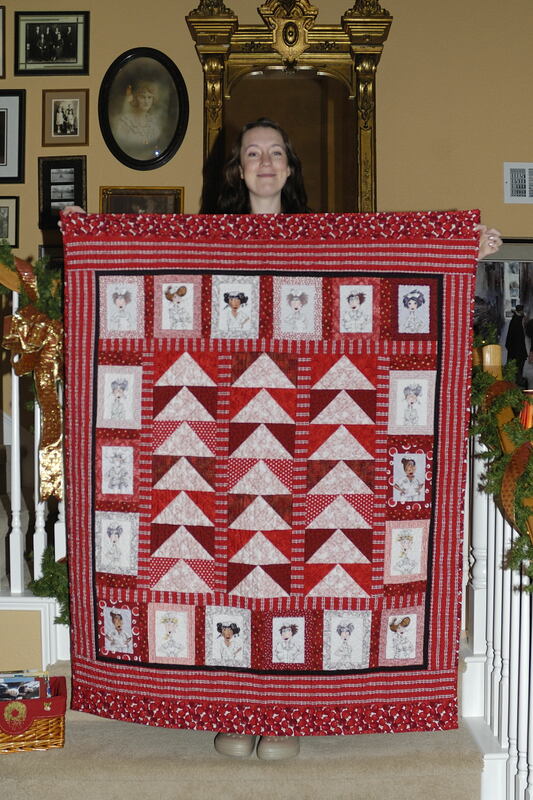 This entry was posted on Saturday, January 3rd, 2009 at 1:38 am	and is filed under Quilting. You can follow any responses to this entry through the RSS 2.0 feed. You can leave a response, or trackback from your own site. Good job on your website. The quilts you poured yourself into were well worth it. What works of art they are. Good job!!! Wow! You are quite the artist! What a great job you did on your quilts. Thanks for sharing your site with me. Where in the world do you find the time? You go girl! Each of those fabulous quilts shows your love for each of your 4 kids and your the many facets of your unending range of creative talents! What a treasure for each of your kids to have a cozy quilted blanket of love ~ designed by you and woven by your hands ~ to use as a daily reminder of how much you love them as individuals. I’m blown away by the enormous time you put into each of those pieces of art customizing each quilt to each person’s dreams and personality. Absolutely beautiful!! So happy you had fun making more memories ~ for you and your family. Thanks for sharing the process and the finished products with me – an aspiring quilter.